Bosnia-Herzegovina will hold elections on Sunday 7th October to choose the three members of the collective presidency prescribed by the Dayton agreement. Milorad Dodik, the current President of Republika Srpska, the Serbian half of Bosnia-Herzegovina, is campaigning to be re-elected in a closely fought campaign, writes James Wilson. 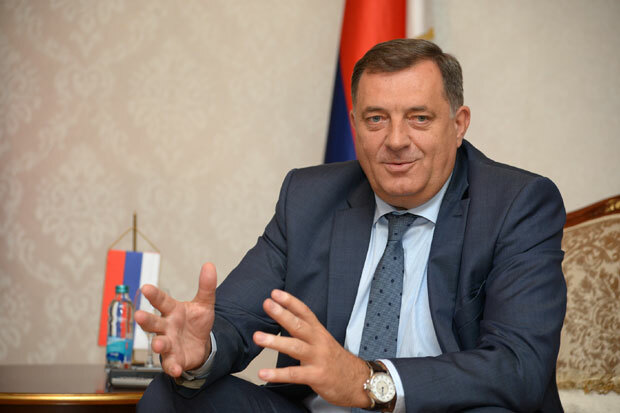 Dodik has been speaking in defence of the Dayton Accord which ended the Bosnian War two decades ago, and calling on the guarantors of the Dayton agreement - the EU, the USAand Russia - to enforce its provisions. He fearsthat Bosnia-Herzegovina will break up if Dayton is ignored, and that this could lead to instability or even war. The Dayton Agreement brought to an end the tragic Bosnian war when it was signed by world leaders in Paris more than 20 years ago. It provides for a stable political system in a state structure with Republika Srpska controlling 49% of the territory and the Federation of Bosnia and Herzegovina 51%, comprising three constituent peoples, Bosniaks, Croats and Serbs, under one constitutional system. The agreement guarantees autonomy to each entity, and sets out protection mechanisms for the national interests for every people. Bosniak political parties were never satisfied with the Dayton Agreement and historically have always wanted a centralised unified state to exercise authority on their own. This resistance to Dayton by Bosniak parties remains one of the most serious obstacles to the development of Bosnia. To the contrary Dayton is still highly valued by the citizens of Republic Srpska who wish to see continued respect for the terms of the agreement and full compliance. Dodik reminds us that the famous US diplomat Richard Holbrooke, who is credited as the agreement's main architect, said back in 1997, "Bosnia is a federal state. It should be established as a federal state. It cannot have a single government, because then the country would go back to war. And that is the reason why the Dayton is probably the most successful peace agreement in the world in recent times, because it takes the reality into account." For the future, greater economic integration with the EU will help to seal a prosperous and stable future for Bosnia, but this will take time, and Bosnia is one of the newest applicants for accession having only started the process in 2016. Approaching a change in its institutions in the summer of 2019 and facing a major shift in voter support for the European project across the continent, realistically the European Union is unlikely to make fast progress with its plans for EU accession for the countries of the Western Balkans. Milorad Dodik has said that he favours EU accession in the longer term, but he wants to see much greater decentralisation of government structures in the interests of better financial management, efficiency and accountability. Decentralisation is in line with the best practice of EU members, such as Germany and Belgium. Dodik has accused the Office of the High Representative of bias towards the Bosniak community, behaving like a colonial governor. "The High Representative has no executive powers, yet he and his Office impose laws, displace democratically elected officials and interfere in the constitutionally-backed authorities," he says. "He even interfered in the Constitutions of the constituent entities without any legal reason. Such interventionism has not contributed to stability, reconciliation and mutual trust." He wants to see the role of the Office of the High Representative radically scaled back so that government structures and institutions in both the constituent parts of Bosnia-Herzegovina can develop and increase their capacity. "This leads to discord and instability, exactly what the Dayton formula was intended to prevent," Dodik says. "I want peace. We all want peace. But the current situation could lead us back to war." Commenting on his remarks, Doug Henderson the former UK Defence Minister said, "Implementing the Dayton agreement is a first step to co-existing in our increasingly linked world community. In the Balkans, stability will require a bonding with the European Union. Only then can economic progress and security be guaranteed." "Dodik has always been a strong leader. After so many years in power he now recognises the realities and constraints of building a stable Bosnia," Henderson went on to say.